When Ontario lettuce is hard to find, look to hearty salads such as this one. It's nutritious, quick to make and travels well for lunch the next day. Peel beet and cut into pieces no larger than 1/2-inch (1 cm). Place on large baking sheet and toss with about 1/2 tsp (2 mL) of the oil and salt and pepper to taste. Roast in 400°F (200°C) oven, stirring twice until tender, about 15 minutes. Meanwhile, in small skillet, cook bacon over medium heat until crisp, about 7 minutes, stirring occasionally. Drain on paper towel lined plate. 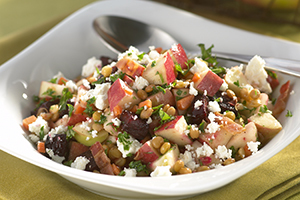 In medium serving bowl, stir together apples, lentils, carrot and parsley; gently stir in beets. Whisk together remaining oil, lemon juice, garlic and 1/4 tsp (1 mL) each salt and pepper; stir into salad. Sprinkle with bacon and feta. Serve at room temperature. (Cover and refrigerate for up to 1 day).